The Women of Peace Lutheran Church, Rosenberg TX, share the following note received from an individual helping with disaster recovery in Tennessee. This person was helping to unpack boxes of supplies and found the address insert that was packed with donated quilts. Please continue praying for the victims of all disasters — whether fires, floods, hurricanes or tornadoes — and know that your prayers and donations of financial resources, goods and time are appreciated. 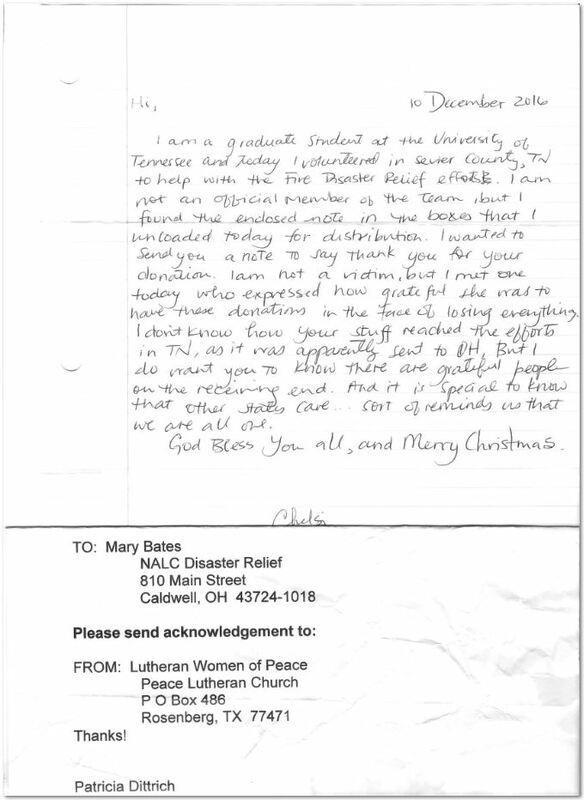 The NALC Disaster Warehouse (810 Main Street in Caldwell, Ohio 43724-1018) needs your donations of quilts, flood buckets, health kits, school kits, layettes, and gift cards (Home Depot, Lowe’s, Target, Walmart). When shipping your donations to the warehouse, please add a note indicating from whom and where the support is coming. The families who receive your help really appreciate knowing you! Contact Mary Bates at 740-509-1132 or batesm55@gmail.com for more information.